Your hands and decolletage are enormously important areas when it comes to signs of ageing. As the skin becomes laxer with age the back of the hands lose both fat and volume, but it is probably the sun damage to the decolletage that causes the most concern to many women. Vertical wrinkles due to decreased hydration of the skin and mottled pigment due to sun exposure are obvious signs of ageing skin. Both are treatable so that you can recover the youthful appearance you once had. There are several ways to achieve this. Cosmeceutical Creams – These are specially prepared creams that are prepared with prescription medicines that are not available in over-the-counter cosmetic creams., and have to be prescribed by specially trained doctor. These rehydrate the skin and help repair the damage caused by the sun. Often they are sufficient on their own or they are used to prepare the decolletage for a comprehensive skin peel which restores the cellular structure of the skin to how it was when you were younger. Obagi Systems are the gold standard in cosmeceutical creams and we use them exclusively. (www.obagi.com) The first choice is to use the Elastiderm for Decolletage system, which is gentle and effective. If your decolletage needs a more intense approach then we would consider the NuDerm system, possibly with a deep skin peel. Have a look the article by Amanda Platell in the Daily Mail about how effective she thinks Elastiderm for Decolletage is. She also combined it with Laser Treatment which is quite expensive. You will get a good effect without laser but if it is needed then we will refer you to colleagues who are expert in the use of lasers. Skin Peels -If the sun damage is particularly severe then you may want to consider a skin peel. Effective, deep skin peels remove the damaged base layer inside the skin and allow it to regenerate to create new, young skin. Dermaroller and Restylane Vital – These are older treatments and they still have their place, but generally Obagi treatments are more effective. The skin on the backs of your hands can be a give-away, making you look older than you really are. With age the skin begins to lose its body and starts to look thin and wrinkly as the bones and tendons show through. If you have spent a lot of time and energy keeping your face fresh and young it is easy to forget that the effect is spoilt by your hands. There are 2 treatments that are available. 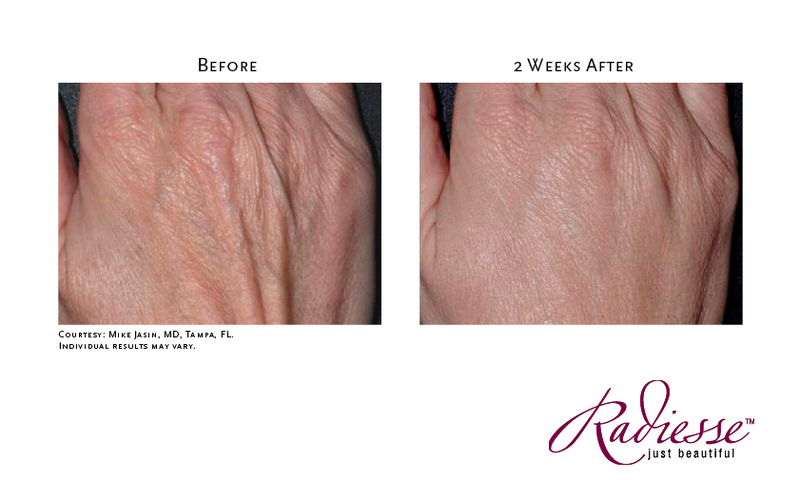 Radiesse is the filler of choice to restore the loss in volume and to give the back of your hands a warm fullness.